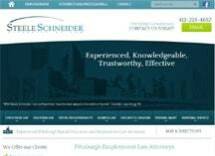 Steele Schneider is a law firm located in downtown Pittsburgh. The Firm emphasizes personal service, prompt responses to client inquiries and skillful advocacy. A fundamental belief of the Firm is that clients are decision makers. To place clients in the position of controlling their destiny, the Firm gives its clients the capacity to make prudent decisions by taking the time to explain the legal landscape and risks associated with every client decision. The Firm believes that demanding clients create a atmosphere where the best possible legal advice is rendered. The Firm offers free consultation to every prospective client. The consultation is an opportunity for prospective clients to get to know the Firm's lawyers and their approach to meeting client needs. During consultation, every question is appropriate. We encourage our clients to be actively involved in their legal affairs. A lawyer-client relationship is a one-on-one personal relationship based on trust and performance. Ideally, the lawyer-client relationship endures beyond the initial engagement of our Firm. For this reason, the Firm's lawyers believe they must earn client trust in every instance and welcome clients to judge them on their performance. With each new client, the Firm strives to create a long term relationship aimed at meeting the client's legal needs.